The tomb of Eve in 1894, during the Ottoman period. The Tomb of Eve, also known as Eve's Grave and Eve's Tomb, is an archeological site located in Jeddah, Saudi Arabia (21°29′31″N 39°11′24″E﻿ / ﻿21.49194°N 39.19000°E﻿ / 21.49194; 39.19000). It is considered by some Muslims to be the burial place of Eve. Prince Faisal, Viceroy of Hejaz, destroyed it in 1928. In 1975, the site was also sealed with concrete by religious authorities, who disapprove of pilgrims praying at tombs. Richard Francis Burton mentions seeing it in his translation of the Book of a Thousand Nights and a Night. In Hamdani (10th century) who states 'It has been related that Adam was in Mine when he felt a yearning to see Eve... that Eve had come from Juddah, and that he knew her on Arafat. 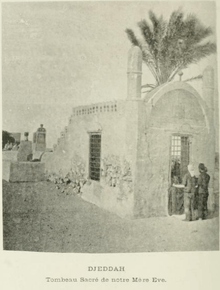 The first one to speak of Eve's tomb as being in Jeddah is Idrisi (mid-12th century). However, Ibn Jubayr (late 12th century), writing from direct experience (unlike Idrisi, he went to Jeddah for the pilgrimage) state that in Jeddah 'is a place having an ancient and lofty dome, which is said to have been the lodging place of Even... when on her way to Mecca... Ibn Al-Mujawir (13th century) makes a clear reference to the Tomb of Eve in Jeddah, and so does Ibn Khallikan (13th century). Ibn Battutah (14th century) ignores the matter altogether. 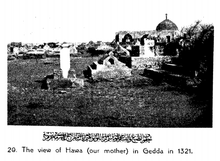 Historians like Tabari, Masudi, and others state that, according to tradition, Eve is buried in Jeddah, but fail to give any detail of her tomb. 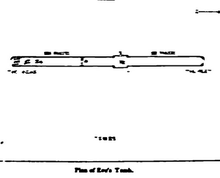 Émile-Félix Gautier estimates the length of the tomb to about 130 meters. Eve must have been a lady of formidable proportions, for the original grave, I was told, was some eight feet long. It was as well, therefore, that she had not survived to welcome us in the flesh, for although it is rumored that we Muslims have an eye for ladies of heroic proportion we draw the line at the titanic. But I was told that the grave had mysteriously extended itself by the time I arrived to its present gigantic proportions. Aun Ar-Rafiq (Amir in Hijaz 1882–1905) tried to demolish the tomb, but this caused a public outcry. He then said: "But think you that 'our mother' was so tall? If the stupidity is international, let the tomb stand". ↑ "Arabia: Tomb of Eve". Time. February 27, 1928. ↑ Burton, Richard Francis, The Book of One Thousand Nights and A Night, p. 358 . ↑ Pesce, Angelo (1974), Jiddah: Portrait of an Arabian city, Falcon Press, pp. 126–30 . ↑ Az-zaman, Wafayat al-ayan wa anba abna (وفيات الأعيان وأنباء أبناء الزمان) (1835–1842), Wüstenfeld, F, ed., Ibn Qalaqis (biography), Göttingen, table II, p. 69, n. 772 (quoted by NALLINO, CA (1939), Nallino, M, ed., L'Arabia Saudiana [The Saudi Arabia] (in Italian), Rome, p. 178 . ↑ Moeurs et coutumes des Musulmans [Uses & costumes of the Muslims] (in French), Paris, 1931, p. 66 . ↑ Westward to Mecca, London, 1928, p. 216 . ↑ Rihani, Ameen (1930), Around the coasts of Arabia, London, p. 74 . Lawrence, T.E. (1921). Seven Pillars of Wisdom. Chapter VIII. The tomb of Eve in 1903. The tomb of Eve in 1913. The tomb of Eve in 1922.